Scientists aver that water on our planet probably came from one or more 'dirty snowball' comets colliding with the cooling sphere (more accurately, an oblate spheroid), creating the potential for life on Earth. Furthermore, today there is not a drop more and not a drop less of water than there was initially trapped by our atmosphere. 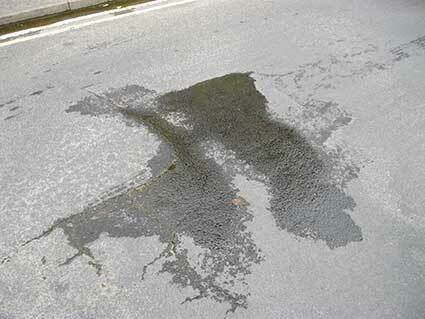 The streets of old Ipswich were paved not with gold but, very often, with water. The bowl-shaped terrain of Ipswich centres on the familiar natural dock with its clearly defined, sharp left-hand turn in the River Orwell (at Neptune Quay) as it narrows and flows to meet the non-tidal Gipping. So, at once we have a wide, tidal estuary stretching up to a large, open pool – sheltered from coastal storms – then narrowing westwards to the River Gipping which continues into the heart of the county. This natural feature is the main reason for the establishment of the nucleus of the Anglo-Saxon town at this point; more specifically it is the narrowing and shallowing of the waterway around the end of today's Great Whip Street which made the river fordable. A crossing point on a water highway, allied to a natural dock is an excellent place to establish the nucleus of a town. So it was with the Anglo-Saxons and Gippeswyk, their first town. Another natural feature which attracted them is the presence of so many springs in the surrounding hills of the 'bowl'. The water percolates to the surface through green sand and gravel layers, purifying it. The clean spring water is held in the permeable Red Crag above, but cannot penetrate the alluvial clay present in areas of Ipswich, so it flows downhill on the surface. This is particularly so of the springs around Cauldwell ('cold well/cold stream') Hall and those found in and around Christchurch and Holywells ('hollow wells' hence the name) Parks. See our Street name derivations page for these and many other sources. Above, the natural dock, pre-Wet Dock enclosure, at lower right and the narrower river to the west of Ipswich which splits into two between Stoke Bridge and Handford Bridge at upper left. Rober Malster (see Reading List Ipswich A-Z) tells us that "the one that flows along the edge of the valley towards Handford Mill is usually marked as the Gipping, while the main channel flowing down the middle of the valley is often delineated 'The salt water'. The more northerly channel is clearly artificial, but it is of great antiquity: it already existed in AD 970. Archaeologists have found a Roman settlement beside it, and the channel may have been excavated during the Roman occupation of Britain [c.AD285 - 480]... There is some evidence that until the 18th century the whole river from Rattlesden [near Stowmarket] to the sea was known as the Orwell, and the stream flowing into Stowmarket from the north was considered a tributary; there is an Orwell Meadow in Rattlesden." Today we consider that northward tributary to be a continuation of the River Gipping, with its source near the village of Gipping; we call the tributary from Rattlesden to the Gipping the River Rat or the Rattlesden River. 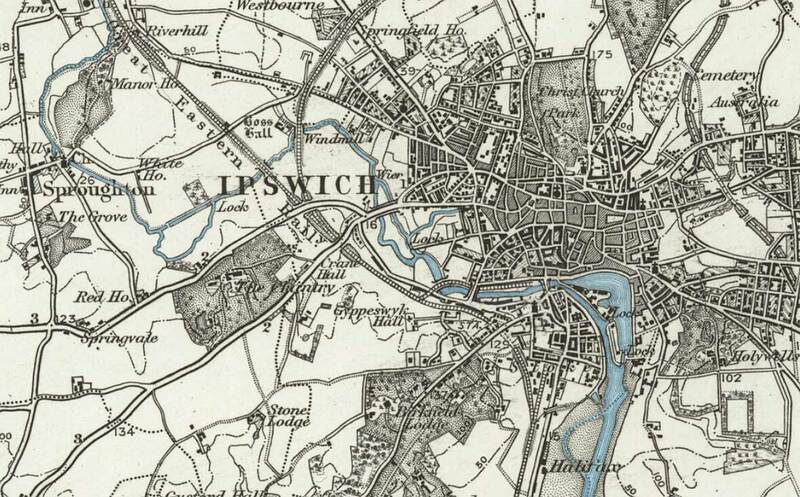 Within Ipswich, the split in the river is sometimes labelled 'River Gipping' to the north and 'River Orwell' to the south; interestingly this practice is continued on modern computerised maps available on the internet. The Gipping navigation met demands for narrow boats to carry materials and goods between Stowmarket, Ipswich and the sea. However, anyone walking along the Gipping River Path (much of it along a horse tow-path) will learn from the information panels that the use of the river by boats goes back centuries. The River Gipping was officially closed as a navigation in 1932. The area between the two river branches was Portman's Marshes. Areas to the south and the west of the natural harbour provided by the River Orwell were particularly known for their marshy character. The extensive waterlogged land provided a natural defence for the town, making it very difficult to launch an attack on foot or on horseback. The river itself provided a defence, too. We have to imagine the river as much broader and shallower around the original fording point used by the Anglo-Saxons (and probably the Romans before them) from Great Whip Street in the south and Foundry Lane in the north (another route for the ford into Turret Lane has also been proposed). The Church of St Mary-At-Quay was famously built on the marshy ground where the spring waters from the surrounding hills pooled on its way into the river. At the time of Cardinal Wolsey, when his Water Gate into his ill-fated College was built (c.1528), the river revetment (strengthened bank forming a quay) was around the line down the middle of College Street. This is but one example of the way in which the broad, marshy areas were drained and reclaimed and the riverside gradually moved back to its present location on the northern quays of the Wet Dock. John Norman tells us that the use of ballast (often soil or broken stone) by trading vessels to ensure stability while sailing empty aided this process. 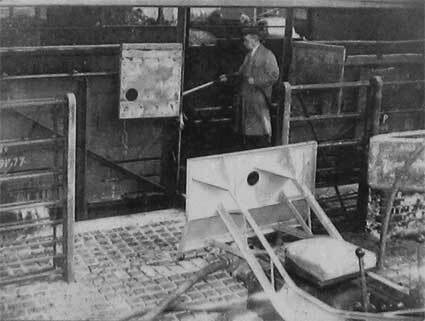 When docking and prior to loading of the cargo, the ballast was removed from the holds and dumped at the river bank. Many repetitions of this process would hasten the extension of the hard quays and the narrowing of the natural harbour. Alsford depicts, to the east, the defences as running from Common Quay on the Wet Dock northwards up Lower Orwell Street, [probable site of the East Gate], Upper Orwell Street past Majors Corner, then westwards along Old Foundry Road (St Margaret's Ditches), [site of the North Gate], Tower Ramparts, [site of the West Gate], then southwards down Lady Lane and the former Tanners Lane (now beneath Civic Drive) as far as Friars Bridge Road. The last section has changed dramatically due to 'modernisation' in the 1960s (see 'Ipswich tomorrow'). It is assumed that there was no need for an earthwork south of this via Greyfriars Road to Stoke Bridge because of the rivers and marshes, water providing a natural defence. Marshland provided ideal grazing for animals. For the six hundred years, between the granting of the Royal Charter in 1200 and the Municipal Corporations Act 1835, the town was run by Bailiffs, Burgesses, and Portmen (the 'great and the good' of the town). The name Portman's Marshes recalls the first Portmen of Ipswich who were granted a meadow named Odenholm or Oldenholm on which to keep their horses. Others have said that they had the right to graze their cattle there – perhaps both are true. 9. most recently, Ipswich Borough Council moved its offices from the CIvic Centre to Grafton House in Russell Road (opposite Suffolk County Council's offices in Endeavour House) in 2005. The 1896 map shows the post-Industrial Revolution river system (marked in blue). Above the legend 'Halifax' and on the west bank we see the Griffin Wharf branch railway crossing Wherstead Road to reach the river. North of that is the enclosed Stoke Bathing Place. The Wet Dock, opened in January 1842, shows two locks, one off New Cut and the one we know today at the south. The lock half-way up New Cut was never popular with mariners: the sharp turn required to move a vessel in line with this lock – particularly when approaching from the north-west – led to some collisions. The south lock was built between 1869 and 1871 to remedy this problem. The Promenade with its avenue of lime trees was the place to be seen on a summer Sunday afternoon stroll down to the 'Umbrella' shelter and Pegasus statue, with views over the river to Hog Highland (south of the Cobbold brewery), it existed between the old and new locks. In 1904 Timber Quay was built over the inner end of the old lock making it unusable. There were originally no quays between the Wet Dock and New Cut, the majority was taken up by a 'mill pond' (clearly shown on the above map) which provided a head of water used to operate George Tovell's roman cement works. The pond, later used for storage of timber, became a branch dock, but was filled in during works on the Island in 1923-5. Tovell's Wharf was constructed on the north side of the Island. Additional notes on the 1896 map. The branch line from the Great Eastern Railway can be seen on the map running across a level crossing on Ranelagh Road and over the river by a small bridge, then round to goods sidings and the tramway which ran all around the Wet Dock and beyond. Parts of these trackbeds can still be found, but many rails have been lifted. Another point of interest is the area at the southern end of Sidegate Lane (upper right of the map) labelled 'Australia'. This would be around Hutland Road and Meadowvale Close (the site of St Helens Barracks). But why 'Australia'? Probably a similar 'frontier' feature to California. Interestingly at this time Belvedere Road with its bridge over the Felixstowe branch line is shown in dotted lines. 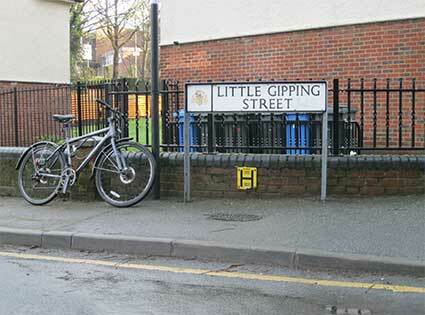 See our Friars Bridge Road page for more on Greyfriars and the Little Gipping. The legend 'Wier' [sic] north of Handford Bridge on the 1896 map is the Horseshoe Weir. It is clearly visible on the 1902 map (below) because it is drawn in – north of 'Seven Arch Bridge (now replaced) carrying London Road – and labelled: 'Highest Point to which Ordinary Tides flow'. It is generally agreed that at the Horseshoe Weir, or just below it, the freshwater River Gipping meets the brackish water of the River Orwell, dependant on the strength of the spring tides. Note also on the 1902 map the 'West End Bathing Place' (see 'Bathing places' further down this page) at the south of the long thin 'island' and at the west end of Portman's Walk (now renamed Sir Alf Ramsey Way); swimmers accessed the pool via a footway across the lock gates where we find a repeat of the the label: 'Highest Point to which the Ordinary Tides flow' on this leg of the river. So, in summary, the point where the freshwater Gipping meets the brackish Orwell moves between the lock and the Horseshoe Weir, dependant on the tides. Just north of the lock is the arm of the Alderman Canal. 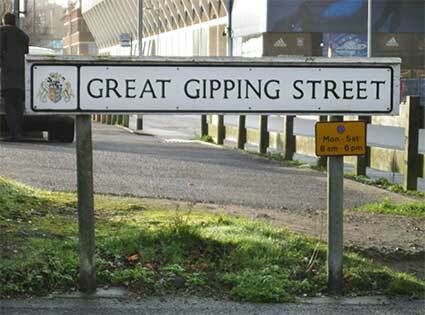 In the past a further section of the Gipping existed, sometimes known as the “Little” or “Upper” Gipping, thought to be a manmade cut which flowed east from the Gipping in Ipswich parallel to Handford Road, before dropping south-east, parallel to what is now Civic Drive, Franciscan Way and Greyfriars Road to rejoin the River Orwell at Stoke Bridge. Only a section of this river now remains, known as Alderman Canal reaching east to Alderman Road, with a return ditch flowing below Alderman Canal, under Bibb Way, through a reedbed to Sir Alf Ramsey Way (Portman's Walk) where it is piped underground to the River Orwell exiting in the vicinity of Constantine Weir. The return ditch was presumably dug when the section south-east from Alderman Road was stopped up in Victorian times. The River Orwell is easy to trace because it follows much the same line today: the south western edge of the marsh. Following the 1953 floods, the river was canalised, sheet piles driven into both banks to stop the town flooding – not particularly attractive at low tide. Since the 1902 map West End Road was built from Commercial Road, crossing London Road, and into Yarmouth Road (the 1930s Ipswich By-Pass). These roads now occupy the long thin island between the two rivers. There is a footpath alongside the river from Stoke Bridge, under Princes Street Bridge, the Bobby Robson Bridge and as far as the weir close to West End Road. As it approaches Yarmouth Road it splits, the route straight ahead becomes the tidal Orwell but the fresh water diverts left under Yarmouth Road, under Handford Road bridge and across Alderman Road recreation ground to the site of Handford Mill (at the top of Alderman Road). From there, it is underground, contained in a culvert (Little Gipping Street marks the line). It crosses the site of the former Portman Road cattle market, under Friars Bridge (clearly shown on Edward White’s map of 1867) where it provides evidence of its presence behind the Greyfriars car park with an elongated hump in the ground, which crosses Wolsey Street, close to the back gate of Jewson’s. The Gipping discharges into the Orwell just above Stoke Bridge appearing under the Skate Park. When the Gipping was made navigable in 1793, a lock was cut between the two rivers near West End Road (Handford Lock). The lock gates have gone and a flow control gate has been installed, holding the waters of the Gipping at a constant level up to Sproughton. The waters of the Gipping cascade, waterfall style, into the Orwell. Note also, on the 1902 map, the complex layout of the 'G.E.R. Eastern Union Line' – how nice that the original name of the Eastern Union Railway from Colchester to the original station in Stoke is still used here; the first EUR train ran in 1846, becoming Great Eastern Railway in 1862. As the goods spur comes off the main line, crosses Ranelagh Road by a level crossing (still visible today), crosses the Orwell and turns towards the docks, another smaller line comes back westwards and northwards away from the goods sidings to run beside the opposite bank of the river, over the cul-de-sac of Constantine Road and round behind the 'Ipswich Corporation Sewage Pumping Station' and the future site of the power station and tram/bus depot. One assumes that the main purpose of this branch was to supply coal to the power station which generated electricity for the trams and trolley buses and also for residential use. At the time that this map was published, work had only just begun on building the power station (Constantine House) and tram depot. Handford Mill was a water-powered mill standing at the east end of this stretch of water, close to Handford Road (see Street name derivations). It is believed originally to have been fed by a stream running down from the Anglesea Road area, but an artificial channel was dug to bring water from a new weir built on the Gipping some way above Handford Bridge. This channel was certainly in use when the bounds of Stoke were set down in AD970; it is possible that this was dug by the Roman occupants to bring water to a mill on or near the site of Handford Mill (the first written record of which is found as early as the 13th century). In the 19th century the mill was used to crush seed to extract oil; no traces of it apparently now exist. A valve prevents flow between the River Gipping and Alderman Canal. The Alderman Canal now only receives surface run-off from its immediate surrounds (principally properties along Handford Road). The Rivers Orwell and Gipping were formerly navigable by means of locks and as recently as the 1970s boats could be hired from Wrights Boatyard, Cullingham Road (on the River Gipping, just north of Alderman Canal). In addition to boat hire, the Yard offered boat manufacture and repair/maintenance. 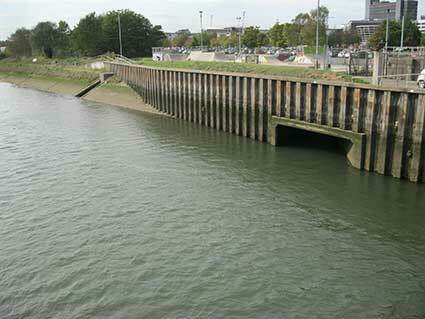 Below: two outfalls from underground conduits into the River Orwell, photographed from Stoke Bridge. A similar outfall exists for the Ipswich Brook which is the underground version of the waters which flowed for centuries down Northgate Street, Upper and Lower Brook Streets; it flows under Star Lane to reach the Orwell and eventually the sea. The Ipswich Brook existed as a watercourse carrying the copious spring water and surface drainage water which flowed down the sides of the 'dish' of Ipswich to reach the main river two thousand years ago. "Ipswich is fortunate that the River Gipping has carved its way down to the Chalk – at about 85 million years old, the oldest and lowest of the surface rocks here. It provides a stable foundation for the tall buildings which line the Waterfront, for the Orwell Bridge and for our new flood gates. It also supplies much of our modern water supply. Younger London Clay (Eocene, 54 million years old) and Red Crag (Pliocene, 2¾ million years old) sediments overlie the Chalk and outcrop higher up in the valley sides. The permeable Red Crag holds water, which gushes out as springs where it meets the impermeable London Clay below. Thus Christchurch and Holywells Parks have a constant and plentiful supply of natural water for their various lakes, ponds and canals, issuing from the Red Crag/London Clay junction. A crucial aspect of human (particularly urban) habitation is the availability of fresh water to the inhabitants. Given the advantages of the clean springwater in the hills around the Ipswich, it was not too difficult to arrange pipework into the town centre. However, the surplus water found its own courses down the bowl-shaped terrain towards the town centre and eventually into the River Orwell. Radial streets from the town centre provided ideal water courses and one of the longest journeys for spring water came from around the Cauldwell Hall estate (marked today by Cauldwell Hall Road and Cauldwell Avenue) on the east of the town which became the Cauldwell Brook. Many early street names reflected the relationship to water. Spring Road did not really exist in the mid-18th century; it was known as 'the old hollow way into Ipswich' and was gated at the foot of the steep hill near today's St Johns Road junction, becoming no more than a footpath uphill through meadows. The upper section of today's Spring Road (roughly from the Cauldwell Hall Road crossroads eastwards to Lattice Barn) was 'the Old Road'. The water flowed down 'the old hollow way into Ipswich' and pooled as it became St Helens Street, called variously 'St Helens Wash' and 'Great Wash Lane' in the past, such was the volume of water during rainy periods. 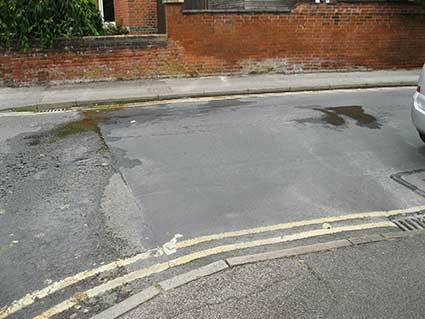 Additional water flowed down Water Lane (today's Warwick Road) carrying flows from Albion Hill (Woodbridge Road). 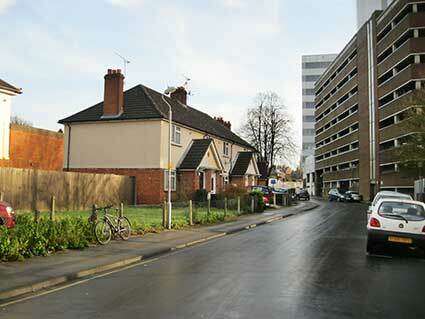 This undrained area at the site of today's Grove Lane junction was impassable by wheeled vehicles at this time. All traffic used 'The Way to Woodbridge' (later Woodbridge Road) to leave the town and that way would have taken them along today's Rushmere Road, the section to Lattice Barn was yet to be built by the Turnpike Trust. [See our Barclays/tollhouse page for more on this.] Our H.W. Turner page shows a flooded St Helens Street in 1911 with shop staff armed with brooms to try to sweep the waters away from their thresholds. Near to today's Argyle Street was Wells Street (commemorated by the 20th century Wells Court flats development), again an indication of the dominance of water to the inhabitants. For centuries in Ipswich there was little paving and no tarmacadam road surfaces, so the water carved its way into the roadways and created mud and pools of clay and liquid horse manure which cannot have aided passage by said horse and cart (which also churned up the roads, no doubt). The Spring Road waters continued past the present-day Argyle Street/Grimwade Street crossroads (Borough Road, later Grimwade Street, originally only ran as far north as Rope Walk – the prison yard was beyond), past the Ipswich Gaol (behind County Hall), to Major's Corner. A sharp turn left into The Upper Wash and Lower Wash (Upper and Lower Orwell Streets), having crossed the Spread Eagle/Orwell Place crossroads where stepping-stones (stepples) were installed to enable the poor pedestrians to cross without getting their feet too wet or muddy; indeed Orwell Place was called 'Stepples Street' at this time. See Street name derivations for more on these street names. The 'Common Wash' around Lower Orwell Street was an area where people washed their clothes. Eventually all this water pooled in the marshes above the northern quays of the dock, eventually seeping into the Orwell. It seems that this would have been the worst place to build a medieval church so the central one of the three dockland churches, St Mary-At-Quay, was duly constructed there and has suffered the structural consquences ever since; in 2016 the building has been saved as a well-being centre and the walls and stone columns repaired and cut off from the destructive rising damp. From leaving the 'Cauld Well' the water dropped about 180 feet to the river. Of course, at a time of little sanitation and open sewers in the medieval streets of Ipswich, the inhabitants used the flowing water to carry away horse and human filth and other waste. The spring water, once so clean and clear, was anything but by the time it reached the river. Even after much of the spring water flow was piped underground in the 20th century (see the following paragraphs), it continues to trickle from hillsides, for example in Grange Road and Alexandra Road (see images below), and the lower-lying streets of Ipswich experience flash flooding in extreme weather conditions. Inhabitants of Spring Road have had their cellars flooded and they really know that there is a deluge when the heavy cast iron drain covers in the roadway are lifted up by the force of the water from the overwhelmed underground pipes. 'It is recorded that in 1463, a ship sailed from Ipswich with men and stores for war. Amongst the stores were 8 ‘pipes of Caldewelle’, containing fresh water brought from the springheads at Caldwell. As early as the 15th century the Blackfriars Priory were bringing the water in through wooden pipes as by the time the spring water reached the town, it become more and more polluted as domestic and trade waste was swept in to the water course. The pipeline, the source of which was probably the springs at Cauldwell Hall, was later to be utilized by the Corporation for general consumption.' For a small fee, the town authorities allowed the water to be extracted along the route but as Dr J. E. Taylor's notes in his description of ancient Ipswich in 1555 some one took the entrepreneurial spirit a bit too far. Edmund Leeche, of St Margaret Parish, seeing the water was so abundant, decided without prior permission, to erect a water wheel upon the course of the Caldwell Brook. By stopping the water, he flooded his neighbour's gardens. It was ordered that “… the said Edmond shall take away his floud-gate and and mill-wheel before Mich. [Michaelmas] next, under £20 pain, to be levied upon his goods and chattels, and that no person shall henceforth keep any watermill there for the grinding of corne”. This order was treated either with contempt or neglect, for five months afterwards, it is stated that “Edmund Leeche, not having taken the floud-gates and mill-wheel upon the stream from Caldwell Brook, it's ordered that he does so before Christide, under peril of £20 forfeiture and for the fine already set upon him." Holywells Park ('Hollow well') tells its own story of water in its name. We include an early 1930s map of the park on our Bishops Hill page, showing all the bodies of water including much of the moat around the Bishop's Palace – which gives the hill its name. See below for an explanation of the so-called 'Holy well': C. Holywells. 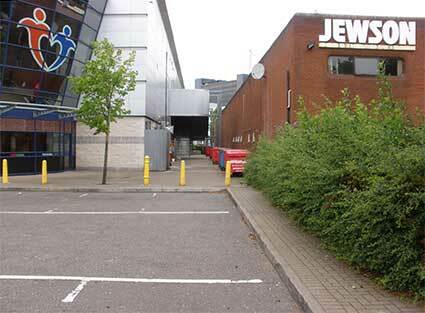 Ipswich as a spa town? In the second half of the 17th century, a spring was discovered on St Georges Street. This would have been one of the many springs which still surround the town; perhaps the location close to the town centre and to the (now lost) Church of St George made it of some importance. 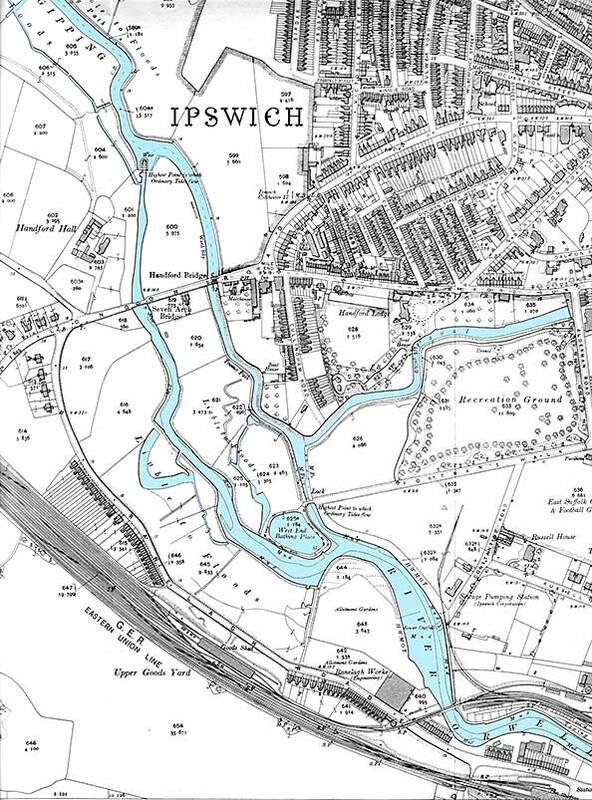 However, Ipswich already had a spa: the ‘Ipswich Spaw Waters’ in St Margarets Green (see B). The idea of opening another spa was rejected. [This text is repeated on our page on The Unicorn, as it relates to 'taking the waters' and the development of a bottled mineral water business, Talbot's.] The medicinal but foul-tasting water of the spring found in St. Georges Street in the late 1600s was never developed into anything, as it could never have competed with the existing Ipswich Spa, a sulphurated spring on St. Margarets Green. 2) H. Seekamp writes that Issac Brook, a cooper, discovered a sunken, brick arched spring in St Georges Lane that he supposed was mineral water as it had such a foul taste. Three Doctors (including famous Dr Coyte) had the water analysed and found it to be equal to the waters of Bath – Medcalfe Russell of The Chantry had been recommended by his London doctor to go to Bath to take the waters took this water instead and was cured. Given the description of 'foul-tasting' waters of St Georges Street, perhaps this second letter can be ascribed to exaggeration by the yellow press. G.R. Clarke in his 1830 history of Ipswich (see Reading List) mentions another spring that never froze in the grounds of a cottage next to The Shears Pub on land belonging to Dykes-Alexander fairly near to the other spring. Richard Dykes Alexander’s house was at the former Bank on Barrack Corner, now converted into flats (see our Blue Plaques page). The water from this well was sent to London for analysis by Mr Barry who stated that it contained iron sulphate, iron carbonate, sulphurated hydrogen (from degrading pyrites) and he saw no reason why this water and Ipswich spring waters with different properties could not be rendered serviceable and bought into general use. As we now know these enterprises did not thrive and it is, perhaps, a tribute to Ipswich that such quackery and snake-oil seller's scams failed in the town, where they were so profitable (but, no doubt, ineffective) elsewhere. Cheers! '[In 1615] the new pipeline was to be supplied from springs near Cauldwell Hall, not far from the source of the Cauldwell Brook. Topography and the street pattern ensured that the route of the pipeline could hardly have been simpler. From the Cauldwell springs, about 60ft above the level of the town centre, the pipe was laid almost in a straight line, following the course of the Cauldwell Brook down Spring Road and St Helen's Street (GreatWash Lane) to the junction with Upper Orwell Street (The Wash) at Major's Corner, then along Carr Street and Tavern Street to the Cornhill, a distanceof a little over a mile.' (David Allen, see citation at the foot of this web page.) The cistern in which the water was collected was housed in a lean-to structure adjacent to the Old Town Hall (formerly St Mildred's Church) on Cornhill with intermediate cisterns along the one mile length. An interesting feat of water engineering. By 1848 nearly 1,500 homes were taking this water from a couple of mains in Carr Street. "Ipswich was one of the first towns in the country to enjoy a piped supply of clean fresh drinking water, initially to conduits (taps) in the street but later directly into their homes. There were two reasons why Ipswich was in at the beginning, firstly the monasteries had both the demand for and the wherewithal to construct supply pipes and secondly Ipswich is blessed with a natural water filtration system. "The Augustinian Priory of St Peter and St Paul, founded in the late 12th century, was situated close to St Peter's church in what is now College Street. Residential accommodation for dozens of monks required a regular supply of drinking water. Traditionally the monks would have carried it from a spring, a well or from a local stream but here there was a natural supply oozing from Stoke Hill on the other side of the river. A supply pipe was required. This lead pipe started in the hillside below St Mary’s Stoke, crossed the river in the shallows upstream of Stoke Bridge and into the Priory. Evidence suggests it was in place by the late fourteenth century. This supply later became a source of water for the Stoke Waterworks Company (supplying St Peter’s parish). "The Monks at Blackfriars almost certainly had a piped water supply discharging into a fountain in the Garth, the garden on the middle of the Cloisters. Evidence suggests the supply was from the Cauldwell (Cold Well) estate on the hillside further east. Although frowned upon by the monks it was the habit of parishioners to tap into this pipe and insert quills (smaller pipes for their own individual supply). "In 1569 the Corporation acquired the buildings at Blackfriars to establish a workhouse, a facility that became Christ’s Hospital, endorsed by Letters Patent from Elizabeth I in 1572. Excavation at Blackfriars have revealed that there was a feature in the Garth and it sounds rather romantic to imagine this as a fountain, continuously issuing fresh cold water for drinking, cooking and washing. "The second reason Ipswich has an almost limitless supply of fresh drinking water is the geology. In very simple terms Ipswich is founded on chalk, overlaid with clay (London Crag) which, above the sloping valley sides, is then overlaid with sand and gravel. Rain water passes through the filtration level (the gravel) which naturally removes detritus leaving clean water to emerge from the spring someway down the slope. Very early on in the life of the town the water was described as being “quite free from deposit, colourless, inodorous, and with agreeable taste.” Thomas Cobbold had been taking shipfuls of Holywells water to his brewery in Harwich (founded 1723) until he realised that it would perhaps be more sensible to move the Cobbold Brewery to Ipswich (1746). "Before the houses were built in Bolton Lane there was a Water House just inside the park, close to the Toll House controlling access to Westerfield and Tuddenham Turnpike Roads. It consisted of a single room with large tank, constantly supplied with fresh water from an adjacent spring, the overflow from which ran down Bolton Lane and no doubt [ended up] as the stream flowing along Upper and Lower Orwell Street. This stream was difficult to cross in Orwell Place so stepping stones were used and the area became the stepples or the Wash.
"Cobbold, who had moved his brewery from Harwich to Ipswich to be adjacent to the wholesome water supply of Holywells sold the water to some 600 householders, expanded this side of the business and established an additional source of (ground) water north of St Clement's Church in what was then Back Street (Edward White's map 1867). The street later became Waterworks Street and the business was purchased by the Corporation in 1892 to become the Ipswich Corporation Waterworks (ICWW). 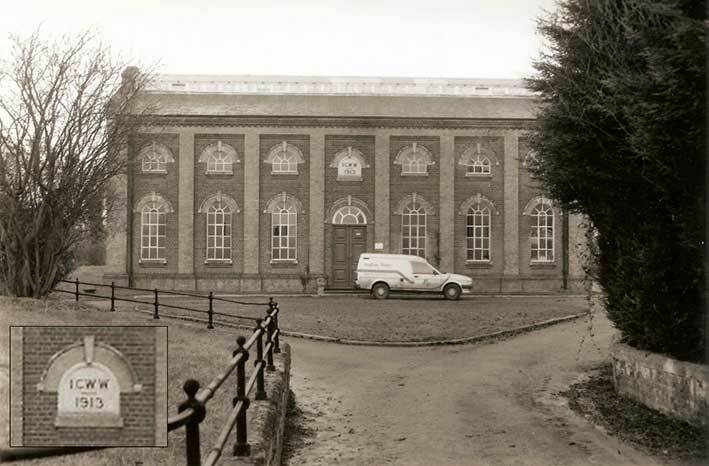 There was debate as to whether they could also take control of the Stoke Waterworks Company, by then owned by the Eastern Counties Railway, which they did. In 1973 ICWW became part of Anglian Water Authority, one of ten regional water management companies. Anglian Water was privatised in 1989." Ipswich Corporation Water Works played an important part in the public health of Ipswich. 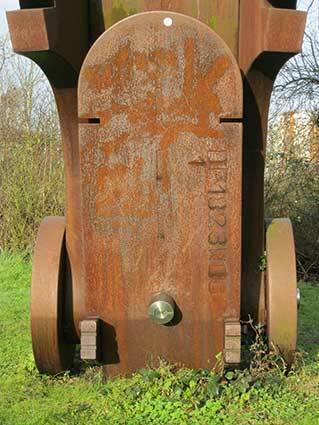 Its story is told on our Street furniture page in relation to cast iron 'ICWW' Hydrant covers set into the pavements. By the mid-19th century, privately-owned reservoirs charged inhabitants for their water supply including those owned by the Cobbolds' in Holywell, the Alexanders' – the Quaker bankers – in St Matthew's and the Waterworks Company in St Clement's. The town's 4,000 other households relied on public pumps or their own wells, most of which were contaminated. As wealthier people moved into homes on the higher ground of the Fonnereau's northern suburb ('the big houses round the park'), pressure increased for better supplies and money, as it so often does (many members of the Council had moved there themselves), talked and the Waterworks Company built a reservoir in Park Road, but it was soon too small – see our Coat of arms page for a feature there bearing the Borough crest. The Council bought the company in 1892 and hastened to review and improve water provision. Water hydrants were placed at strategic points; it was calculated that the consequent rise in rates would soon be recouped by householders by the lower fire insurance premiums. By 1900 virtually every one of the town's 14,000 households had running water. The above 1990s photograph by Tom Gondris can be found on the Ipswich Society's Image Archive (see Links). The pumping station lies in a dip in the surrounding land to the north of the Whitton housing estate and close to Akenham Church – on of the most remote churches in the county. Sewerage is the infrastructure that conveys sewage (human waste and waste water from a variety of sources) or surface runoff (stormwater, meltwater, rainwater) using sewers. The words 'sewage' and 'sewer' came from Old French essouier (to drain), which came from Latin exaquāre. Concomitant to the improvement in water supplies was the crying need for adequate sewage provision. It is worth recalling the uncomfortable fact that, in the past, many households stored their human ordure in tanks and sold it to the Night Soil Man to be sold on to farmers for manuring their fields. Imagine one of the tightly-built courts or yards and the fact that an average human might produce five hundredweight of solid waste in a year; no wonder Ipswich town was odiferous. Worse still, building sewers not only increased the rates, but resulted in loss of income. Not just to individuals, but to importers of London's sewage which arrived in boats at Ipswich docks for distribution around Suffolk for improving crop growth. Perhaps when Suffolk people run down Ipswich there is a folk memory of a time when it was an inlet for Londoners' faeces. For many years the open sewer was commonplace: a central gutter in a dirt road into which residents poured the contents of their chamber pots and much else. If they were fortunate, the gutter would be flushed down with spring water moving towards the river. 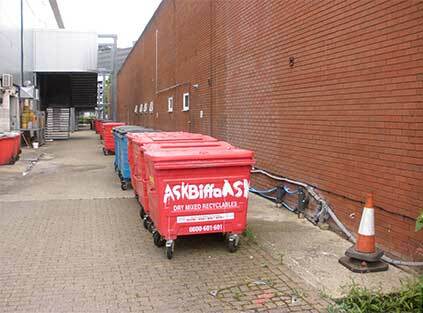 Another method of disposal was the dunghill; the area now bordered by Upper Orwell Street, Bond Street and Eagle Street bore the name 'Cold Dunghill'. Cold Dunghill was a street listed in the 1851 census enumerators' books defining an area outside the town ramparts Later, the town's shallow and inadequate sewers once discharged into the River Orwell at Common Quay. 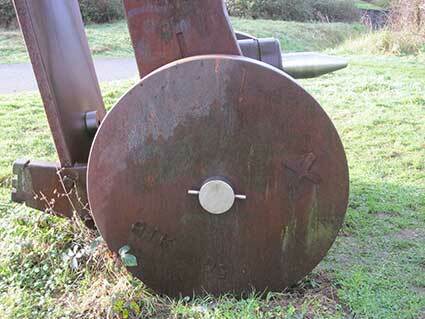 This outlet was moved south of the gasworks on the east bank when the Wet Dock was built in 1842. Peter Schuyler Bruff, the famous railway engineer responsible for the EUR railway tunnel through Stoke Hill, was asked to design an improved sewage system in 1857. It was not until 1881-2 that, with modifications, this system was built because of the authorities baulking at the cost. 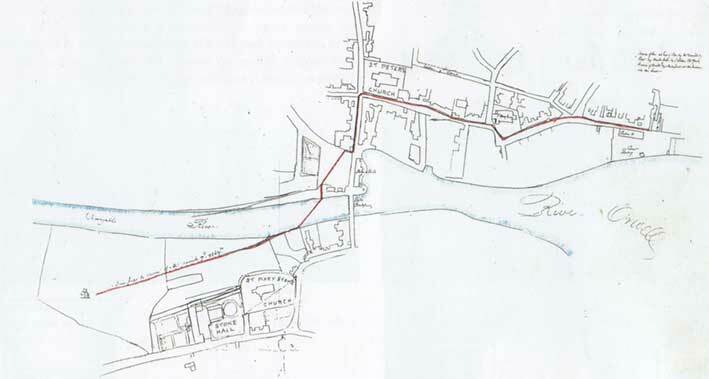 Bruff's low-level sewage system through the heart of the town eventually reached outlet tanks and a treatment plant a mile downstream at Hog Highland (now part of Cliff Quay) on the Greenwich Farmland. Ironically this had been a favoured picnicking spot, visible to those taking a Sunday stroll on the leafy Promenade on the Island. The final cost of sewer-building was £60,000. This week’s article is written under a false premise. I very much doubt if you have ever seen this ‘icon’ and you almost certainly never will, but it is an essential bit of kit contributing quietly to the well-being of Ipswich, writes John Norman, of The Ipswich Society. 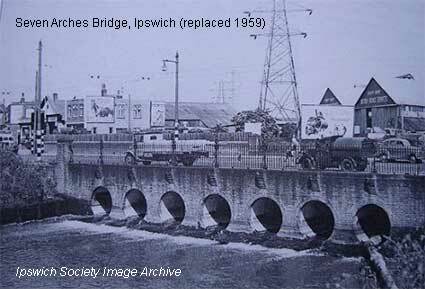 Ipswich was late introducing public sewers and although Peter Bruff (of Eastern Union Railway fame) was commissioned to design a drainage system in 1857 it wasn’t until 1882 that the low level trunk sewer was constructed. The reference to ‘low level’ implies across the lower part of the town centre, Bramford Road to the Wet Dock and on to Pipers Vale (the site of the present day water treatment works). In 1927 civil engineer Edward McLaunchan designed a modern sewage system and treatment works (completed in 1932). A key component was the high level sewer which ran from Norwich Road through the town centre and then across the Suffolk College site to the new sewage works. McLaunchan promoted a scheme with a final outlet into the Orwell that would not leave solids on the river bed or cause offensive odour. It proved to be a very efficient system, but it wasn’t designed for, and couldn’t cope with, sudden surges caused by heavy downpours. In such conditions the system simply overflowed, into the Orwell, into the Gipping, and occasionally into the street. By the end of the 20th Century the town’s sewers couldn’t cope in times of heavy rain. They were perfectly adequate for the everyday sewage but because Ipswich has a combined system (both rain water and foul discharge into the same drain) when a major storm deposited substantial quantities of water in a short time the sewers overflowed, and the mix of rain water and sewage spilled into gardens and low lying areas. In the 1990s a European Urban Wastewater Treatment Directive instructed all water authorities to make changes to stop this happening. In Ipswich the solution was Project Orwell, a deep level large diameter sewer from Bramford Lane allotments along the line of Norwich Road, Anglesea Road, under Christchurch Park and then sweeping a slow curve to Alexandra Park and Duke Street to Toller Road. All of the major sewers the new tunnel passed under were allowed to overflow into it thus in times of great storm the new tunnel simply held a vast quantity of water until the storm had passed, water that was then pumped (usually overnight) to the treatment works. 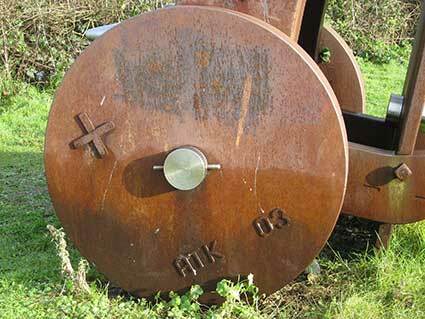 Project Orwell started in January 1998 with a large round hole, a vertical shaft on a site adjacent to Toller Road. A tunnel boring machine or TBM, affectionately named Athena by the guys on site, was lowered into the hole and slowly but surely dug her way the 5km to the west side of town. She drilled a 2.5m diameter hole through soft chalk some 20 metres down, pulverised the chalk with the lubricating water and pumped the resulting slurry back along the tunnel. This was then carted away for use as an acid neutraliser on local farmland. Athena was followed along the bore by a railway line, an ever- increasing length of single track which was used to deliver tunnel linings, additional track and men to the workface. The narrow gauge railway didn’t last long; as soon as the TBM reached its destination the track laying process reversed and all signs of the railway were removed leaving a smooth bore, clean-lined tunnel with nothing to hinder the flow of water. In addition to the tunnel six vertical shafts were constructed to act as additional storage capacity, each has a vent about the size of a lamp post which is the only visible sign of the vast construction project below the surface. Civil engineers Amec completed Project Orwell in March 2000, in total it had cost Anglian Water £33 million but had provided relief from the unpleasant flooding that some residents had increasingly suffered." Further reading – David Allen: The public water supply of Ipswich before the Municipal Corporations Act of 1835. Suffolk Institute of Archaeology and History, 2014. The construction of the Wet Dock in the late 1830s also caused the closure of the town's bathing establishments: that in St Clement's run by John Barnard, a second (which was only a few years old and featured hot salt water, vapour and shower baths0 next to St Mary-At-The Quay and the third in Over Stoke, off Wherstead Road. All three were replaced by another Stoke Bathing Place run by the Corporation. Some will recall – and many will have heard of – this Stoke Bathing Place which was 100 yards long and was situated close to the bottom of New Cut, today the site of a sophisticated anti-flood barrier. It was defined by straight barriers dividing it from the wide river basin and was refreshed by tidal waters. Swimming here was spartan or invigorating depending on your viewpoint. Here is an aerial view of Stoke Bathing Place in 1930 from the remarkable Britain From Above collection (see 'Special subject areas' in Links). Note that the Griffin Wharf branch line curves in from bottom centre. 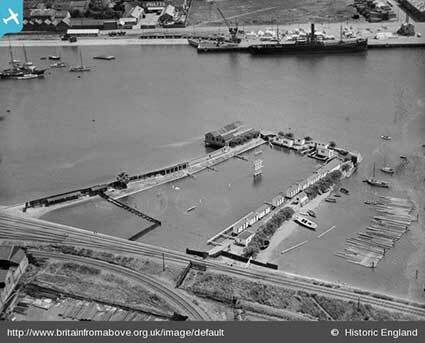 The Stoke Bathing Place was removed in.. during the building of the West Bank container terminal. See our St Helens Street page for a similar aerial view of West End Bathing Place on the Gipping at the end of Constantine Road. It closed in 1936 due to pollution from the river. Piper’s Vale Pools were on the east bank of the River Orwell, they opened in 1937 close to where the Orwell Bridge is now. It was demolished in 1979. Fore Street Baths , one of the earliest such public swimming pools in the country, continues to provide bathing facilities in Ipswich, particularly for clubs and schools. St Matthew’s Baths closed after Crown Pools opened in 1984. This roofed site was open for swimming in the summer and the bath was boarded over and used as an events venue in the winter months, playing host to many groups including a young Led Zeppelin. Broomhill Pool was built in 1938 at a cost of £17,000 and has been closed since 2003. A campaign has been running since then to reopen the site. See our Ipswich in 1912 PDF for photographs of bathing places on pages 31-33. The Gipping Valley River Path includes the section starting from the industrial dockland at Stoke Bridge through wooded areas, dual cariageway fly-overs to quiet backwaters. It features include old watermills and navigation locks. The 17 mile river path through the western evirons of Ipswich, through Sproughton, Bramford, Needham Market and Stowmarket. In 1793 200 men built 15 locks along the River Gipping. These improvements allowed barges to travel the 17 miles from Ipswich, and industries in Stowmarket developed rapidly. The Gipping Valley River Path follows the route of the old tow path once used for horses drawing the narrow boats. Today it is difficult to imagine some sections of the river as being navigable, not to mention some parts of the tow-path being suitable for a heavy horse as nature and flooding has reclaimed and reshaped some areas. But it's still a beautiful and varied walk. Against the tide by Laurence Edwards (2004) is a public sculpture on the west side of Bridge Street, depicting a rower struggling against waves and currents. 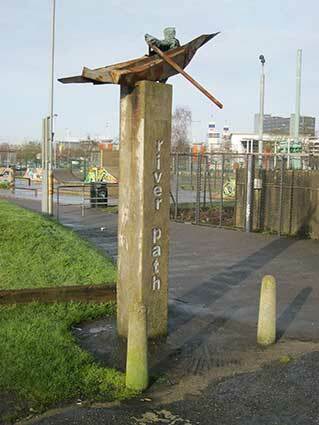 It is mounted on a tall pedestal which bears the words 'river path'. The Sarsen stones stand close to the Skatepark, west of Stoke Bridge and were arranged by local artist Bernard Reynolds. These stones originate from sedimentary rock laid down about 60 million years ago and were dug from the river in the 1970s when the flood defences were built. 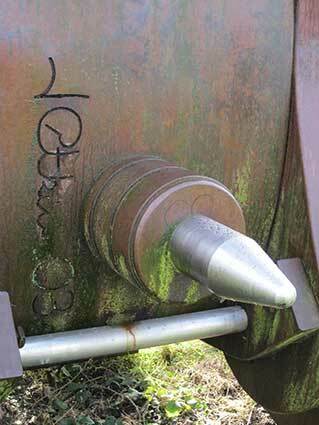 They are so hard they impeded the driving of steel piling. They are silica-cemented sandstone from the sands between the London Clay and the Chalk, and show a well-developed mammilated (curved bumps) surface. Unfortunately the stones are much abused by spray-paint and worse. 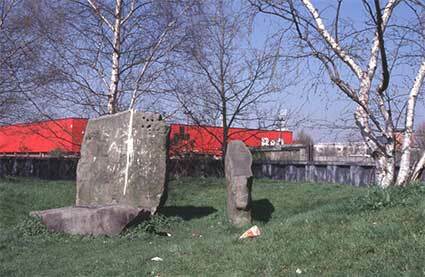 Above: some of the stones in the 1980s in a view from the Ipswich Society Image Archive (see Links) with railway sidings and the Commercial Road – now Grafton Road – branch of B&Q store (now closed) in the background. The Navigator (2003). John Atkin was commissioned to make this sculpture for Ipswich, alongside the River Orwell, by The Ipswich Society and The Ipswich River Action Group. Inspired by the town's maritime history and industrial past, influences were found amongst a variety of sources, from 19th century stern castings for ships, navigational instruments, to pattern templates, the 'wheels' of industry and human anatomy. It features a variety of cameo and intaglio lettering including the artist's name and date near the spike at the rear of the sculpture. 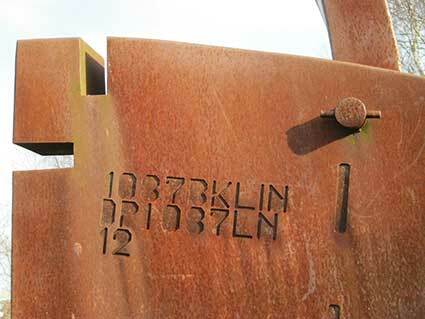 This work was constructed in Cor-Ten steel, a material that is synonymous with the area's past industrial use; the layer of rust protects the structure from further corrosion. 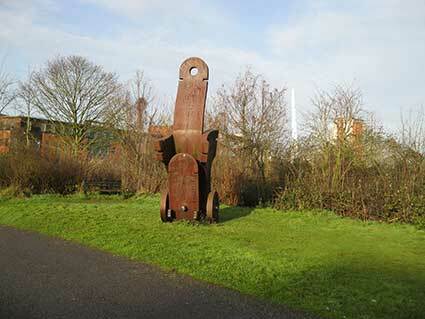 It stands 16 feet high alongside the river, adjacent to a cycle path. Hosing out the cattle trucks at the riverside rail head.